Anthurium flowers look absolutely beautiful! About 200 years ago, this species looked different compared to today’s appearance. Grown in the rain forest of Amazon, they had a plainer appearance. Discovered by Samuel Damon during the 1800s, these flowers come in a wide range of colors and variety. They usually come in red but don’t be surprised if you see them in orange, yellow, or even blue. Every color has a beauty of its own. These flowers are used during weddings and other celebrations! This charming flower has a special appeal to attract people around them. 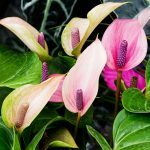 If you want to learn more about anthurium flowers and their endless variety, this article is the best thing to start! 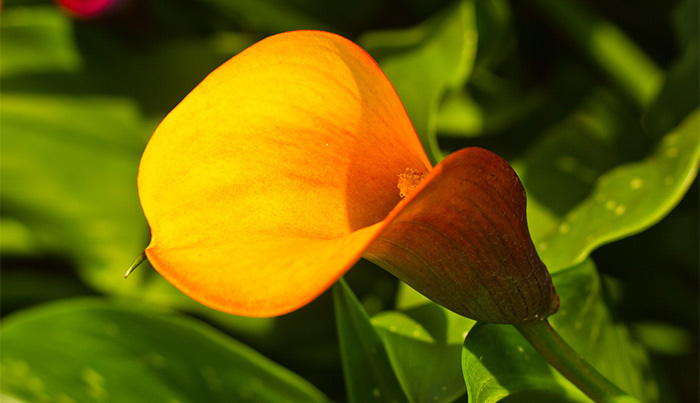 The orange anthurium flower is vibrant and beautiful. 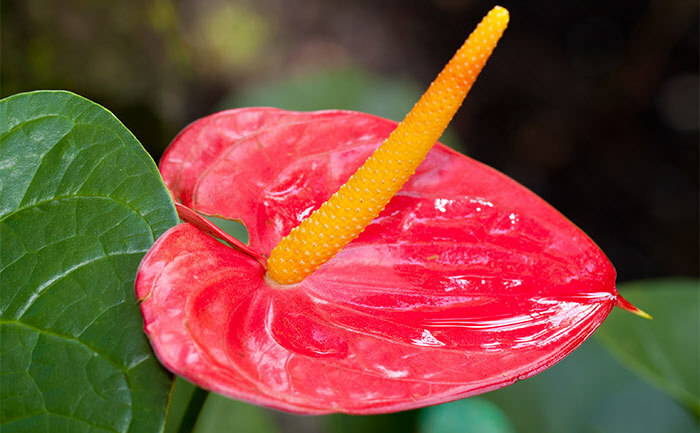 Rare to find, this color of anthurium flower represent the color of insanity. Its long leaves and deep yellow stem add to the beauty of its appearance. These flowers easily grow, once the conditions are met. Good fertilization and ample shade allows them to blossom without a problem. Well drained soil is a prerequisite as the plants rot quickly in waterlogged conditions. The obake red anthurium is a gorgeous heart shaped blood red flower, which is widely appreciated and used across the world. They are actually waxy modified leaves which have a fleshy spike. Tiny flowers are known to grow on them. It requires organic soil, and good drainage and water retention to grow properly. The pink anthurium is rare to find. However, if you notice closely, the color is not exactly pink. A lighter shade of pink with a good combination of green and yellow enhances the beauty of this waxy leaf. These flowers need rest for a total of six weeks during the winter months. Regular watering helps the plant to grow profusely in the next season. 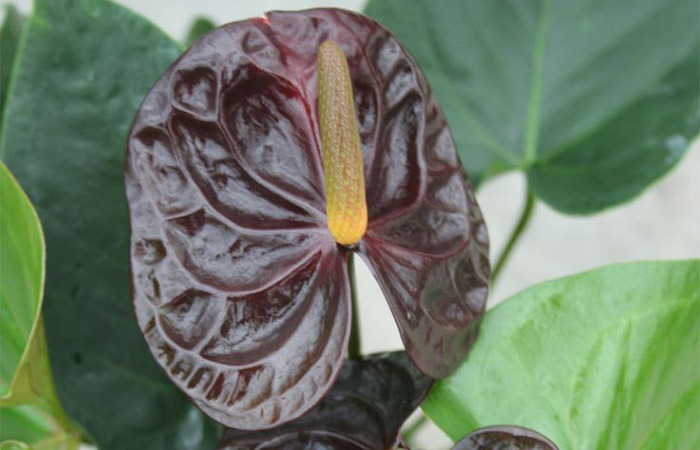 The chocolate anthurium flowers are tropical plants and belong to the Araceae family. They are heart shaped, usually large and glossy in appearance. The reason behind the deep color still remains a mystery. Usually we can find these flowers in the Netherlands and New Zealand, especially when the Valentine’s Day nears. Grown in warm climate, these flowers need to be handled with care since they get bruises easily because of their fleshy nature. 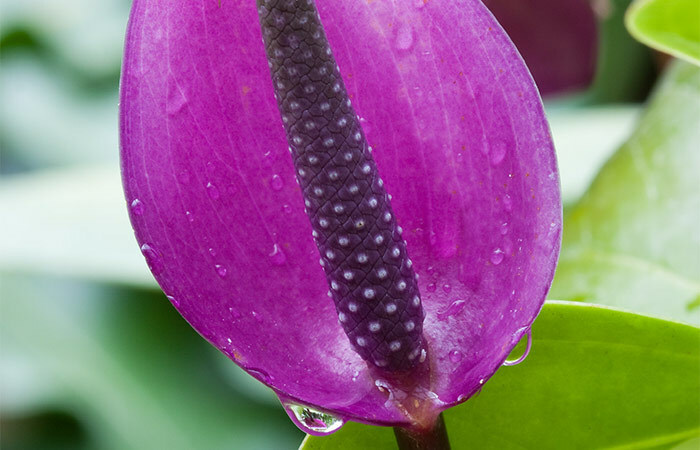 The purple tulip anthurium flowers grow mostly in the tropical locations of America. A whole lot of it is grown indoors as well. Since they are jungle plants, they need to be protected from the sun. The ideal temperature for these flowers is 60°F-72°F during the day. When it gets lighter at night by 10 degrees, it becomes perfect. High humidity and regular sponging of leaves are also needed. 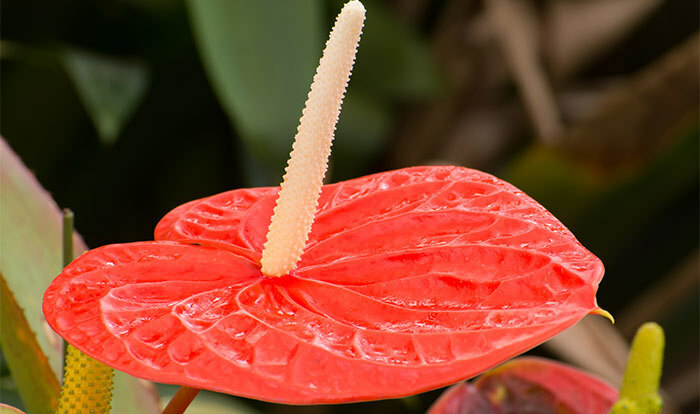 The pigtail anthurium is also called the Flamingo flower. They fall under the category of tender and tropical perennials. These flowers are exotic and attractive in appearance. It’s important to be careful while handling them since every part of the plant is poisonous. It blooms in late winter and early spring. It’s best not to store the seeds. Sow them as quickly as possible. The green anthuriums are great flowering houseplants. It is easy to take care of them, since they don’t need much moisture and humidity. You can easily find them at plant stores or flower shops and nurseries. 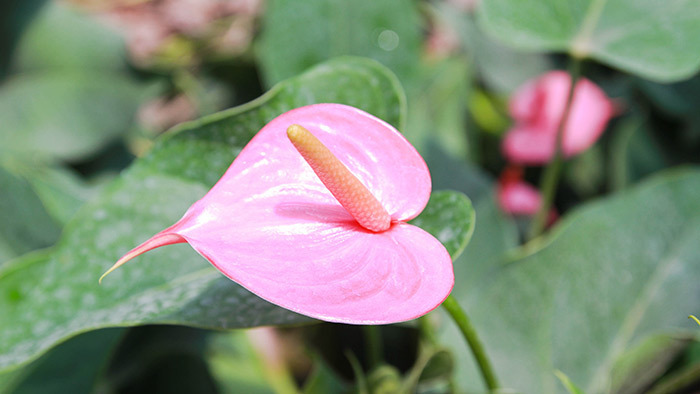 Even though green anthurium flowers have some special requirements, you can still grow them successfully. The temperature should be between 60°F to 80°F. High humidity and good moisture will allow these flowers to grow quicker. The dark blue anthurium is absolutely beautiful to look at. You could use them during weddings or other formal occasions. The bright color and dark green stem will surely add spark and beauty to the occasion. It starts to flower during the early months of spring and lasts till late summer. If there are good conditions, these flowers are definitely going to grow the way they should. Make sure the plant is watered well and the moisture content is enough. Since anthuriums collapse quickly, proper watering is a must! 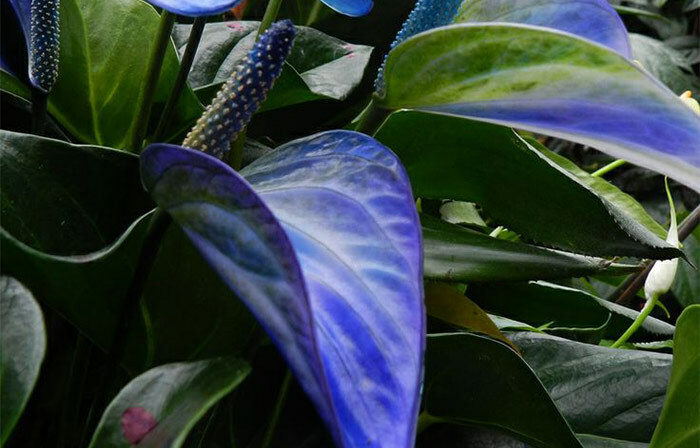 The light blue anthurium flowers tend to be lighter in shade compared to the dark blue one. 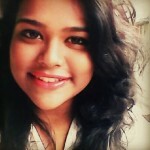 Nonetheless, the appearance is quite attractive. They can grow on a wide variety of soils. They have long leaves. 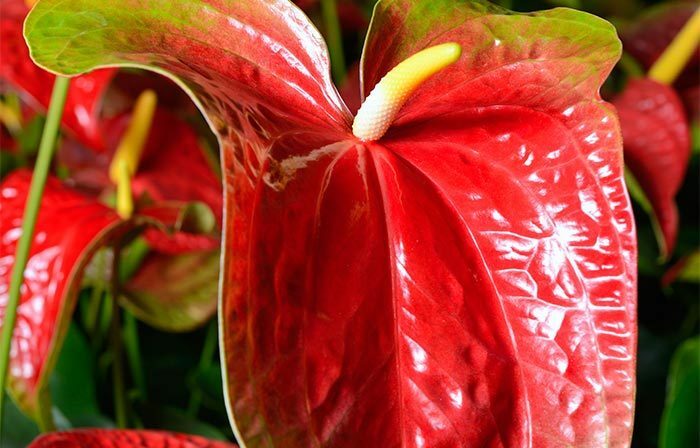 These flowers are not eatable like the other anthurium plants and can cause stomach diseases if consumed. They can be grown on a fence or your garden. Linda da mol anthurium or yellow anthuriums look amazing. The leaf is thin and has a vein like appearance. Usually 8 inches long, they look fresh and attractive all the time. It usually starts to blossom during the spring season. Each plant produces 3 leaves. These flowers are found everywhere. These are available in a couple of shades. You can use these flowers to decorate the inside and outside of your house. I guarantee they will look glamorous! 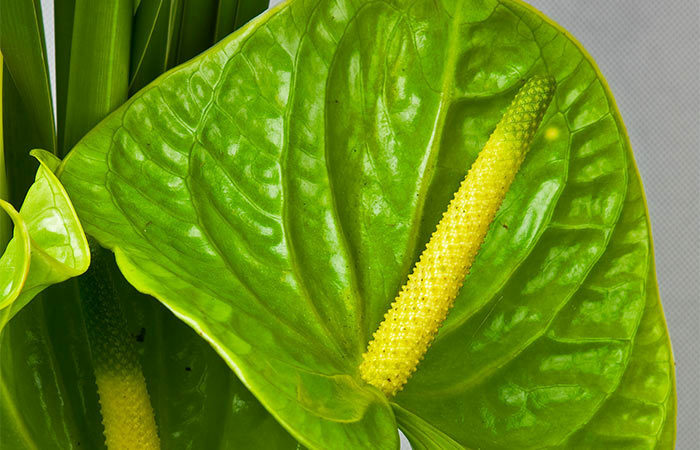 Out of all the different kinds of anthurium flowers, one that stands out the most is the cream anthurium. The lovely pink border makes this flower look more attractive and radiant in appearance. They are eye catching and delicate. They are also available at your local flower shop. Since they tend to be large and well shaped, visitors and guests are going to be lured by its rich and glamorous appearance. 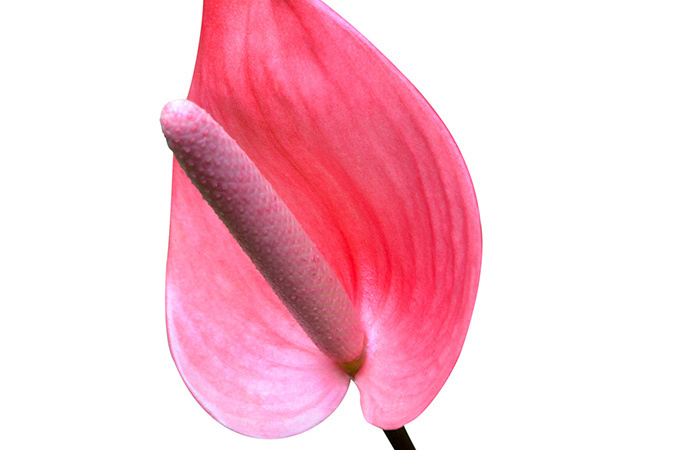 Often cream anthurium flowers have been used during weddings as wrist corsages. You could also use it for this purpose. Hot pink sirion anthuriums are long lasting flowers. These tropical flowers will last in your vase for about 15 to 30 days. Usually shipped in florist trays, they stay in better condition when left unpacked. To avoid any kind of bruising, take good care of it while packing. High humidity and misting are some of the prerequisites for these flowers. Once they have been bought home, cut off 2 centimeters of the stem with the help of a sharp knife before placing them in a vase. This will help the flowers last longer. 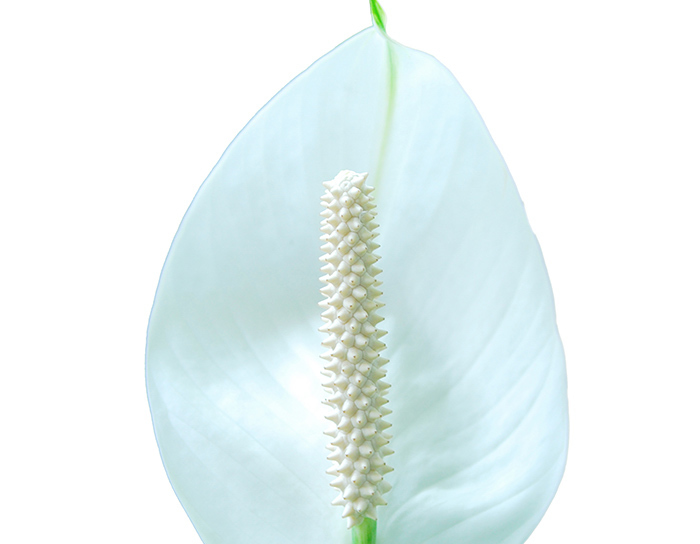 White Anthuriums have often been called peace lilies. They belong to the beautiful country of Columbia and include pothos and caladium as relatives. The cultivation process of these bright flowers takes maximum 9 to 11 weeks. Ensure regular watering of the plants. If it wilts once, the leaves will recover after a while but the flowers probably won’t. These flowers have mostly been used in cigarette smoking rooms, since they have the ability to remove the pollutants from the air. 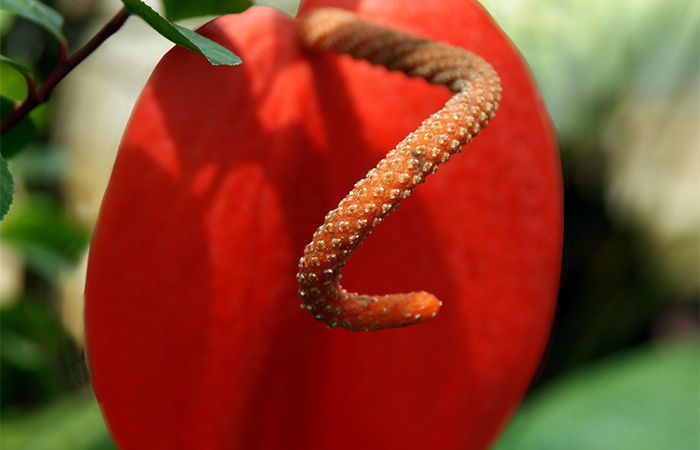 The bicolour midori anthurium flowers have an unique appearance. They are found mostly in tropical regions of South America. They are available in two colors, such as a fancy shaded border which covers the two hearts shaped sides of the leaf. The other color is rich and has been spread all over the flower. You will find them in different color combinations, such as white and green, pink and green, yellow and green etc. Since they are long lasting by nature, you can keep them in your vase for a whole month. The stems can be 16 inches minimum and go up to 32 inches maximum. 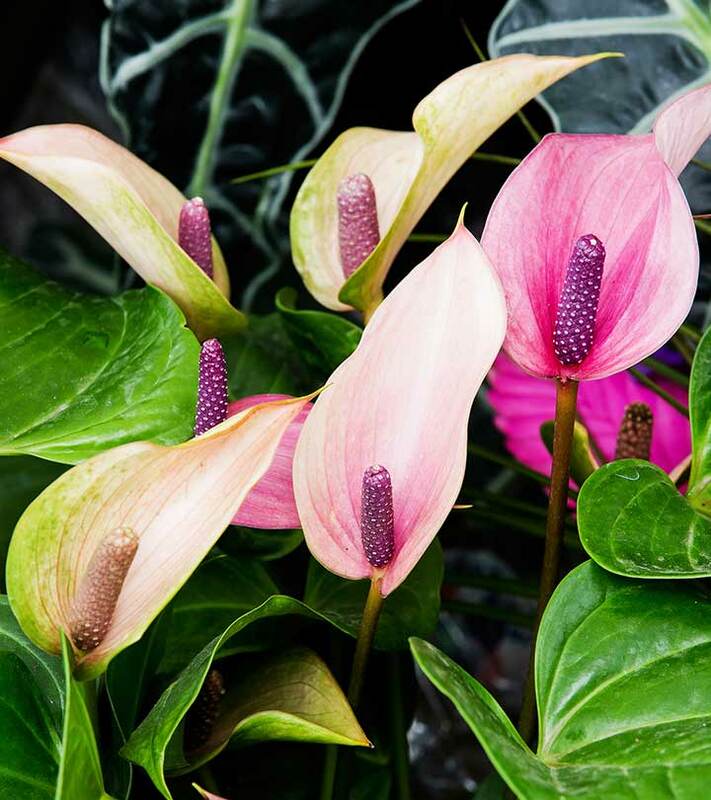 The shaded anthurium is a rare variety, which attracts people easily. It has an attractive yellow and white spandex. It is a perfect mixture of red and white. The diameter of this flower is not more than 14 to 16 centimeters. The flower looks very attractive because of the shaded pink and red color, which is spread all over the flower. So much beauty to choose from! 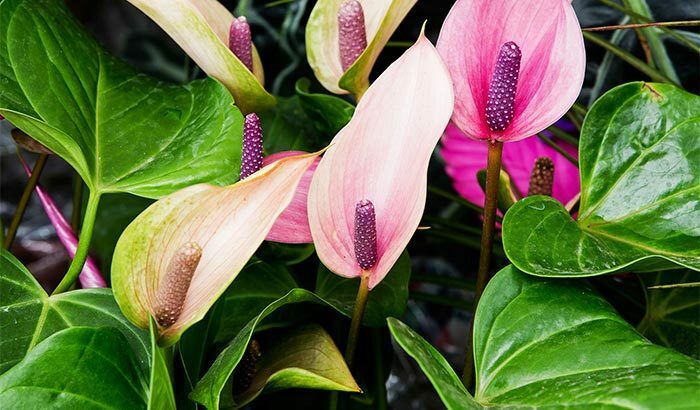 Whether you grow the flowers in your garden or keep the cut flowers in your vase, anthuriums will surely make your life and home much more beautiful! Do you like anthurium flowers? Which variety is your favorite? Share your views with us in the comments section below.